Wed., Dec. 6, 2017, 1:17 p.m.
SEATTLE – Everyone loves a good mystery, and everyone needs a beacon of hope to rally around, which is why the Shohei Ohtani saga is the Hot Stove obsession of the century. No one knows how good this guy is really going to be, and no one has a royal clue what he’s looking for in his search for a new ballclub in MLB to play for. And yet seven fan bases have convinced themselves landing Ohtani is going to transform their franchises. The Mariners are one of the lucky ones, having made Ohtani’s first cutdown. In fact, the two sides had a meeting Tuesday in Los Angeles, according to a baseball source cited by Times reporter Ryan Divish. But anyone who tells you they have much inside information about this whole process is lying, because Ohtani’s people aren’t talking and the negotiations are so delicate the teams themselves have gone into radio silence. Even loquacious Mariners general manager Jerry Dipoto is clamming up for now. But I hereby grant permission for Mariner fans to get cautiously optimistic. Emphasis on the “cautiously,” because, again, it’s all hunches and supposition at this point. For instance, just three days ago, a lot of informed baseball people had a strong hunch Ohtani would end up with the Yankees. They didn’t even make the first cut. Neither did the Red Sox, or any team east of the Mississippi besides the Cubs. If you look at the Magnificent Seven – the Mariners, Angels and Rangers from the American League, and the Dodgers, Giants, Padres and Cubs from the National League – you can see the vague outline of Ohtani’s wish list. All seven teams train in Arizona. 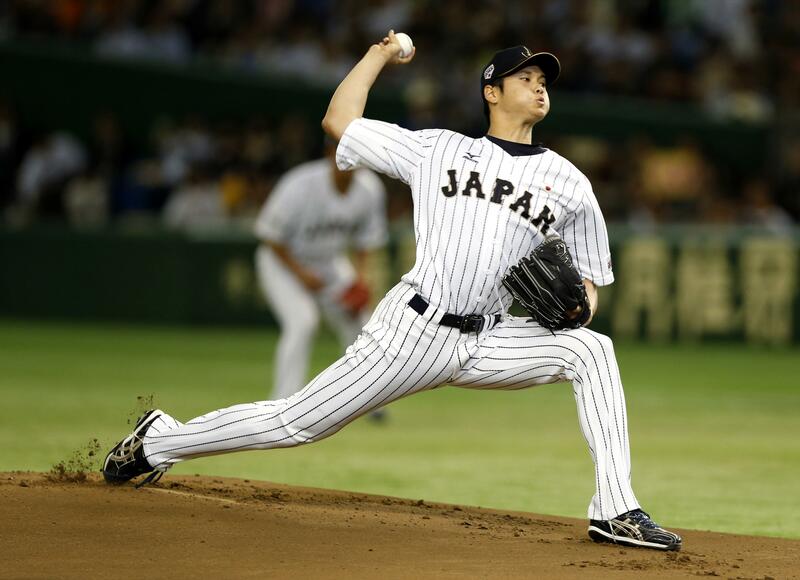 Ohtani’s Japanese team, the Nippon Ham Fighters, have a working agreement with the Padres and have trained the past two springs at the Peoria Sports Complex. Yes, the same Peoria Sports Complex the Padres share with the Mariners. So he has a comfort level with the place he would call home during those vital first six weeks assimilating to his new ballclub. Five of the seven are from the West Coast. The exceptions are the Cubs and Rangers, both of whom have other benefits to overcome what appears to be a deficit. The Cubs are an elite brand, well known in Japan, and the brain trust of GM Theo Epstein and manager Joe Maddon no doubt will make a compelling presentation. The Rangers, besides having the largest available international signing bonus to offer ($3.53 million, compared with $1.55 million for the Mariners), can hammer home the fact they were the team that brought Ohtani’s hero, Yu Darvish, to MLB. But it would seem geography is a check in Seattle’s favor. Most of the remaining teams qualify as small market, the exceptions being the Dodgers, Angels (if you count them, as I do, as representing greater Los Angeles, rather than just Anaheim) and the Giants. Count that as an apparent plus for the Mariners as well. Ohtani is going to be facing tremendous pressure as he attempts to become the first impact two-way player since, well, Babe Ruth, and doing so under tremendous scrutiny. It stands to reason he would want to put himself in a relatively low-key environment. Bingo, and bingo. That describes the Mariners, but it also describes the Padres, who suddenly are emerging by many estimations as a legitimate dark-horse candidate – once again based mainly on hunch and supposition. The Padres have a lot of rather tenuous links to Ohtani, but they also are a National League team, which would seem to be a disadvantage when it comes to accommodating his desire to be a two-way player. On the other hand, some people think a creative National League team could make it work. The Padres don’t have nearly as deep of a history as the Mariners in assimilating Japanese players, which could be a positive or negative. There were reports out of Japan last week Ohtani wants to go to a team without a strong Japanese presence, perhaps to allow him to carve out his own niche. All along I assumed the Mariners’ relationship with Ichiro, Kaz Sasaki, Hisashi Iwakuma, et al, would be a plus; maybe it will actually work against them. Who knows? Indeed, that could be the tagline for this entire process: Who knows? Who knows what a 23-year-old from another culture is going to deem a dealmaker, or deal-breaker? Answer: Hardly anyone, and they aren’t talking. But when you factor in a whole array of cultural, quality of life and baseball factors that seem to matter to Ohtani, the Mariners stack up very well. And they have a general manager in Dipoto who has made the pursuit of Ohtani his obsession. Bottom line, I have no idea where Ohtani will play baseball in 2018. The fact that the Mariners are still in there pitching is a great sign for those who choose optimism, cautious or otherwise. But for now, the mystery continues, and the beacon of hope remains theoretical. Published: Dec. 6, 2017, 1:17 p.m.